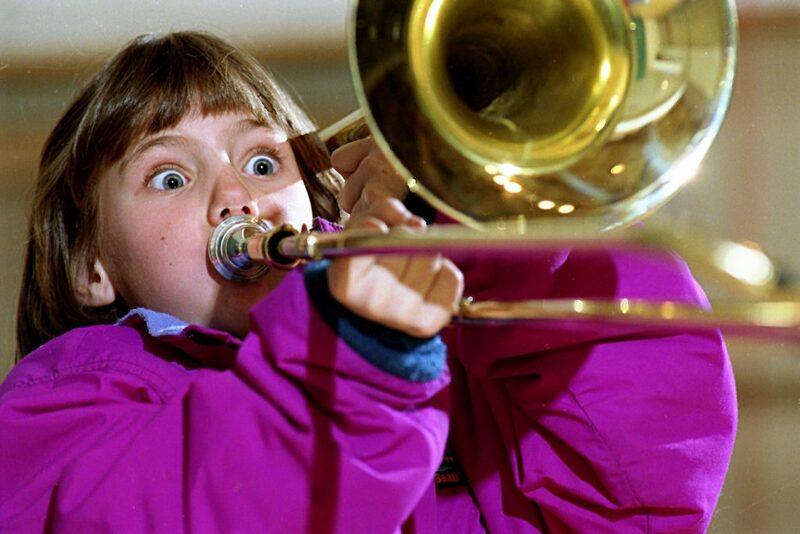 Fourth-grader Kathryn Harris, 9, tries out a trombone during a demonstration of band instruments by David Ellis of Ellis Music Co. at Marion Cross Elementary School in Norwich, Vt., on March 4, 1994. Ellis is carrying on a tradition started by his father, Richard Ellis, more than 45 years ago. (Valley News - Geoff Hansen) Copyright Valley News. May not be reprinted or used online without permission. Send requests to permission@vnews.com. 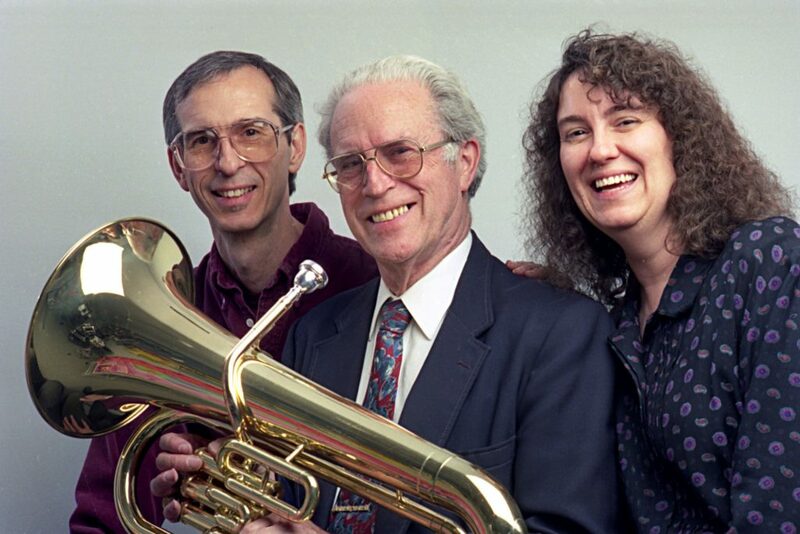 Photographed on March 7, 1994, Richard Ellis, center, started Ellis Music Co. Inc. in 1946. The company president is his son David, left, and its treasurer is his daughter, Joan Bassett. The company, located on Route 107 in Royalton, Vt., rents out more than 10,000 band instruments throughout Vermont and much of New Hampshire. (Valley News - Geoff Hansen) Copyright Valley News. May not be reprinted or used online without permission. Send requests to permission@vnews.com. 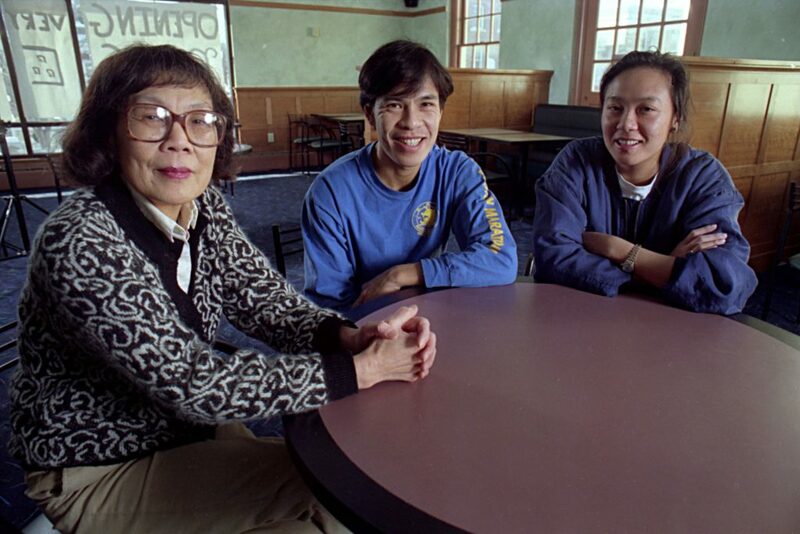 Photographed on Feb. 6, 1994, Cynthia Ou, left, opened a restaurant in Hanover, N.H., with help from two of her children, Eddy and Emily Ou. Ou had been running a Chinese restaurant in the Dartmouth Medical School cafeteria for over two decades, serving over a million lunches. (Valley News - Geoff Hansen) Copyright Valley News. May not be reprinted or used online without permission. Send requests to permission@vnews.com. 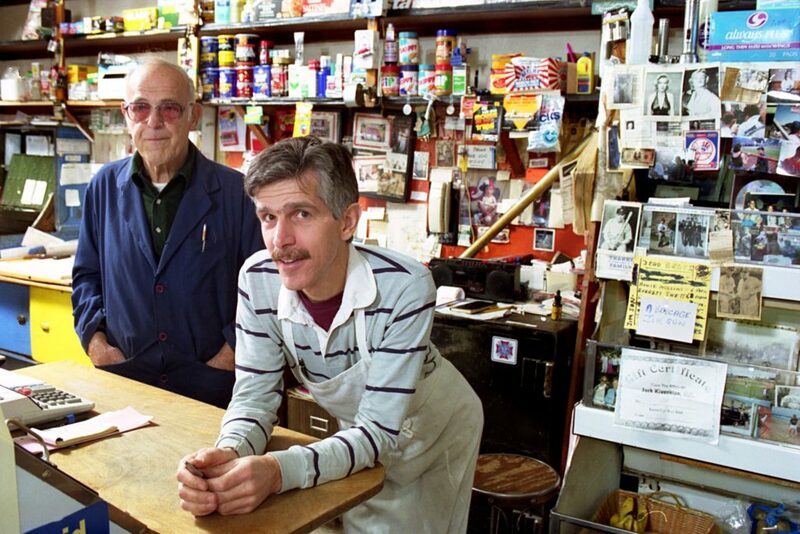 The Falzaranos, Ralph Sr. and Ralph Jr., are photographed at Progressive Market, their White River Junction, Vt., store on Oct. 25, 1993. The younger Falzarano was looking to revamp the 75-year-old market to serve Italian foods as a long-overdue tribute to the local Italian community on South Main Street. (Valley News - Medora Hebert) Copyright Valley News. May not be reprinted or used online without permission. Send requests to permission@vnews.com. Brian Campion works in Stitches, his new tailoring shop in downtown Hanover, N.H., on Nov. 3, 1993. Campion was poised to become the fourth generation to run the family's clothing business when it closed in 1991. He started the tailoring shop with equipment and employees from the store. (Valley News - Medora Hebert) Copyright Valley News. May not be reprinted or used online without permission. Send requests to permission@vnews.com. 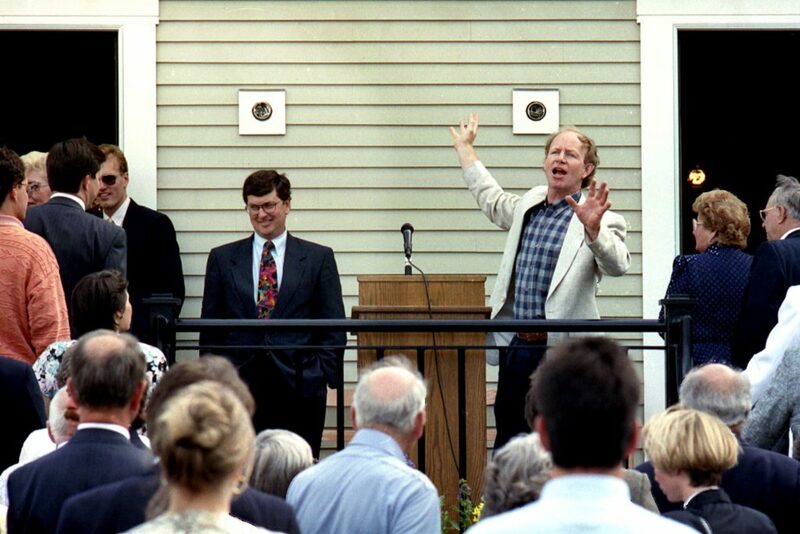 Simon Pearce talks to people gathered on June 3, 1993, for the opening of his new plant in Windsor, Vt. "The truth is," said Gov. Howard Dean at the event, "this economy isn't going to recover until the Simon Pearces of this world" begin to follow what has already been done in Windsor. (Valley News - Robert Pope) Copyright Valley News. May not be reprinted or used online without permission. Send requests to permission@vnews.com. 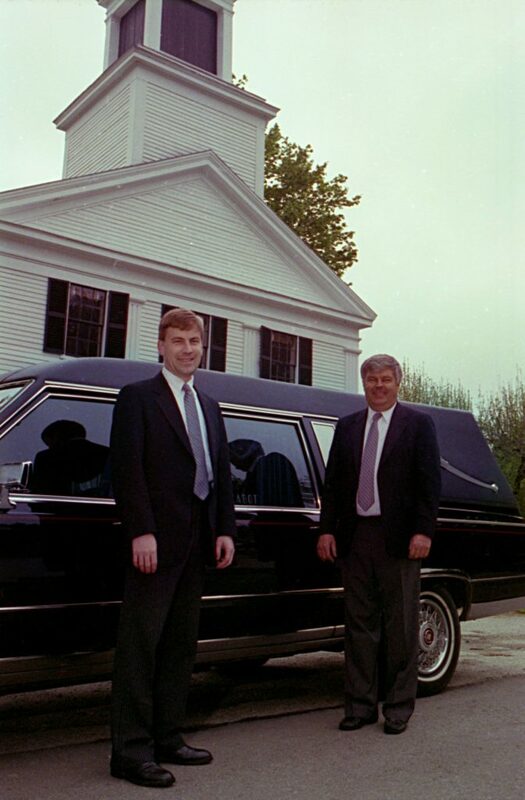 Greg and Dwight Camp of Cabot Funeral Home before a service begins in Plymouth Notch, Vt., on May 20, 1993. 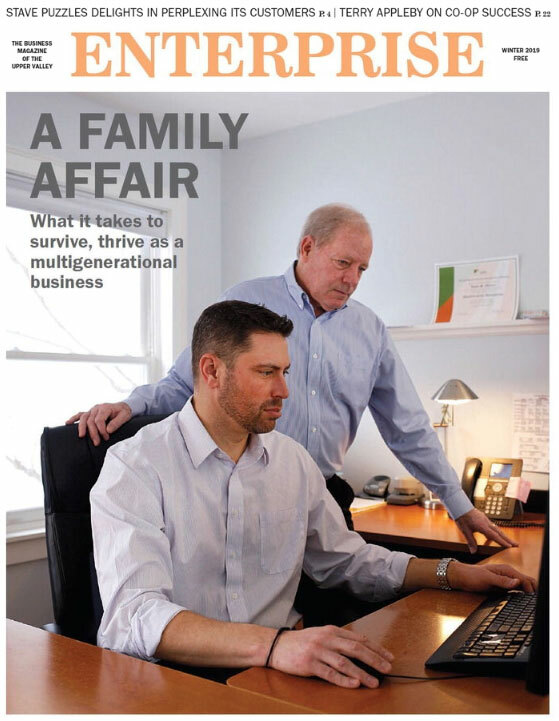 The business was started by the late Willard Cabot, Greg's great-grandfather, in 1917. The Camps conduct about 80 funerals a year. (Valley News - Medora Hebert) Copyright Valley News. May not be reprinted or used online without permission. Send requests to permission@vnews.com. 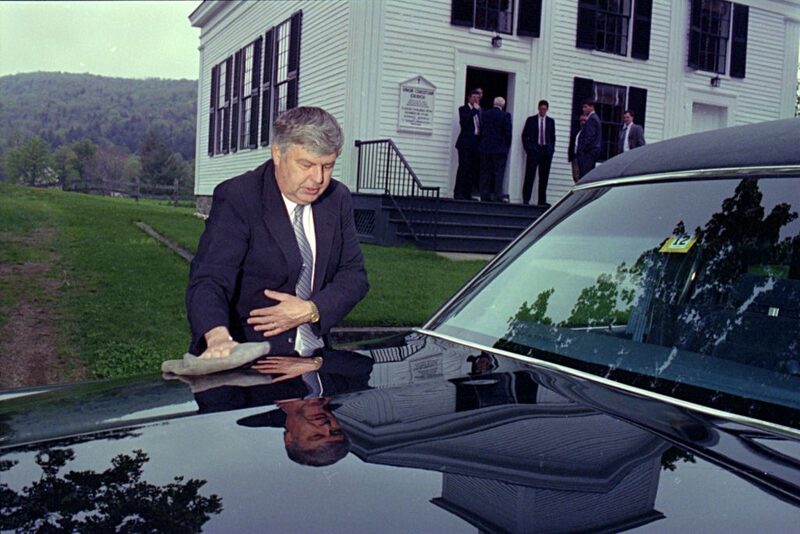 Dwight Camp dusts off the Cadillac hearse at a funeral held at Plymouth Notch, Vt., on May 20, 1993. Camp is amongst four generations who have owned Cabot Funeral Home in Woodstock. The life of a funeral director is not all somber and grim. "We cry with the people, but we laugh with them, too," he said. (Valley News - Medora Hebert) Copyright Valley News. May not be reprinted or used online without permission. Send requests to permission@vnews.com.